One of my favourite places to visit on the Dingle Peninsula is the Lispole Valley. This area is a delight for anyone interested in antiquities. There are too many to mention here, but amongst them are the alignment and standing stone at Ardamore and Minard Castle is also nearby. On this trip we drove to the western end of the valley and stopped at Aghacarrible to see the amazing rock art carved on this 3.7 metre long stone. Until recently the stone was partly hidden under a field wall. 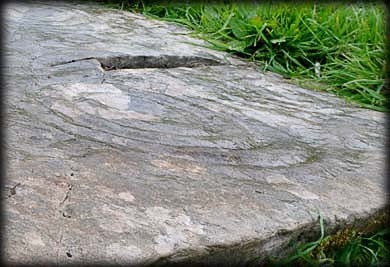 The stone is decorated with some cup-and 3 circle decoration as well as at least forty plain cup marks. 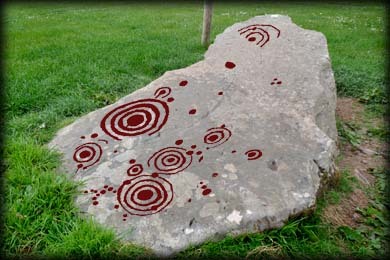 Most of the rock art is illustrated in the image shown right.. Also present on this farm is a ringfort with a clochan and souterrain. Situated: From the N86 before Lispole, take a left turn at the shop at Kate's Cross. Then right and then left. Then first right and then next right. In a field 800 metres on your left. Discovery Map70: V 5119 9970. Last visit May 2013.